Whenever we see the reality of momentous shifts in society, it’s always good to go back and take a look at the people who saw it coming far away. Generally speaking, there were usually people who understood what was happening in advance. For example, Daniel Bell wrote his book The Coming of Post-Industrial Society in 1976. There were probably even other earlier books touting the same theme. One person who clearly saw the challenges that globalization would bring to the developed countries was Richard C. Longworth. Longworth was a reporter for most of his career, and a long time foreign correspondent at the Chicago Tribune. Most readers here probably know him from his 2008 book Caught in the Middle: America’s Heartland in the Age of Globalism. But arguably more important was his 1998 book Global Squeeze: The Coming Crisis for First-World Nations, a book in which Longworth predicted most of the dynamics that would play out in the next two decades, culminating (so far) with Trump’s election. He predicted massive job displacement from China’s entry into the global trading system, describes how developing world countries would move up the value chain, predicts the erosion of middle-class standards of living, the rise of the gig economy, and the deterioration in race relations. He puts his finger on the nationalism vs. globalism debate and anticipated populist revolt. He didn’t predict everything, but he nailed an awful lot of it. I don’t know how this book performed in the market, but its timing was certainly inauspicious. It came out right as the dot com boom was going nova. Just as one contemporaneous event, on March 30 of that year James Glassman and Kevin Hassett wrote an op-ed in the Wall Street Journal (which no longer appears to be online) that became the basis of their now infamous 1999 book Dow 36,000. I was then in my late 20s and about to leave Andersen Consulting (now known as Accenture) for a telecom startup. I had no inking of how the future would ultimately play out, but I was incredibly, and naively, optimistic. Since coming out of school at the end of the early 90s recession, the tech industry had been booming beyond belief. The post-mainframe tech transitions of the 90s, plus the nationalization (and early stage globalization of business) drove fantastic demand for consultants and while collar workers. It was truly the golden age for young people with college degrees. Unlike today’s Millennials, who are experiencing downward economic mobility, our salaries were soaring. Having a great employer and living in a nascently gentrifying Chicago, I was living in a bubble. I certainly did not see trouble ahead in these boom times. I was aware that manufacturing was in structural decline, but my assumption was that this was transitional and generational. Future generations would enter the exploding white collar workforce as I had and industrial displacement would be as forgotten as agricultural displacement had been. I didn’t see it coming. But Longworth did, even in those boom times. World trade is based on the idea that each nation should make what it makes best and most cheaply, and then trade those wares to another nation for what that nation makes best and most cheaply. In the process, both nations will prosper and will have access to better goods than if they tried to do it all themselves. This is the principle of ‘comparative advantage.’ It also has very little to do with trade in the real world of the global economy….Trade as it exists today bears little resemblance to the textbook images dear to the heart of free traders, for several reasons. One reason deals with the ability of giant firms to create comparative advantage and move it around the globe. If world trade used to take place between companies in different countries, it goes on as often now between branches of the same company operating in many different countries…These are not cases of countries taking advantage of their natural competitive advantages to make goods and services that can be sold freely to less-favored countries. They are cases of companies using technology to build enclosed and controlled trading systems. [Robert Z.] Lawrence and most of his mainstream colleagues are devoted free traders, literally trained from their undergraduate days to reject the thought that trade can cause more harm than good. Lawrence has even warned against letting such ideas get around, saying, ‘The very perception that a link exists [between trade and labor problems] could put the continuing evolution of trade and investment flows at risk.’ No one actually accuses these economists of faking their evidence to protect the sanctity of free trade. But it’s clear that many economists have carefully limited their research to product the results they wanted. The growing evidence that free trade can indeed cause severe damage, and that this damage may even outweigh the gains is producing nothing less than a religious crisis among the true believers in the economics departments of American universities. They may possibly have had a momentary crisis of faith in the 1990s, but if so, they quickly repented of their heresy. If anything, the economics profession today is more militant and more hysterical about any impingement on global trade than they used to be, even as they finally start to admit, belatedly, that just maybe trade with China has had some negative effects on American workers. I’ve been wanting to dig more deeply into trade economics because like Longworth I’m not convinced that the studies that are touted regarding trade’s effect on employment tell us what they are marketed as doing. For example, we frequently hear that research shows that relative few jobs were off shored, and that most job losses have been due to automation and other onshore productivity improvements. Yet I then read articles saying that just one company, Apple, and its subcontractors employ 700,000 people in China. And I wonder: were these 700,000 jobs a) lost to trade/off shoring b) lost to automation or c) counted in some third bucket we’re not being told about? If they aren’t in large part doing jobs that would otherwise be done somewhere else, what the heck are all these untold tens of millions of workers in China manufacturing products for export actually doing? [China] has every intention of upgrading its exports from clothing and toys to high-end, high-tech, high-profit goods such as cars, electronics, and pharmaceuticals….and it is using its trade and investment policies to force Western companies to help it achieve this mastery, which it clearly intends to employ to compete with these countries in the future. Western and Japanese companies that want to invest in China are forced to bring in modern technology and teach the Chinese how to use it. If Japan was a problem, China will be a catastrophe. It seems impossible that the world trade system, with all its benefits, can withstand an assault of this sort….The major nations must now begin planning new rules to limit aggressive exports of this sort and to demand strict reciprocity – equal access to the markets of China…This is of course, both protectionism and managed trade, and will be attacked as such by purists who consider anything less than free trade a sin. But trade is an economic issue, not a theological one. The First World nations have civilizations worth protecting. If the price of that protection is some protectionism aimed at global predators, it seems folly not to pay it. This was of course rejected, and these civilizations are in fact badly damaged. And the global trade system is in serious jeopardy as a result, as Longworth predicted. Longworth at this point in time clearly sided with the nationalist perspective, though as we’ll see in part two this review, his personal and political background created cognitive dissonance on this point that caused him to ultimately side with the very people he raked over the coals in this book. This is the proletarianization of the middle class, which once considered itself set for life in cushioned cubicle of big corporations but now finds itself pitched onto the pavement, a loser in the global competition for jobs. If there is a focal point of the growing debate on the global economy, it is here, where people work….The global emphasis on profits, the unrelenting pressure of the capital markets, and the search for best practice preclude comforting answers. The truth is that no one at this stage can give answers with assurance. The logic of global markets leads to more pressure on workers, not less. Millions of new workers appear on the world market every year, all hungry and ready to compete. The power of computer-driven automation makes it at least possible that, for the first time, new technology will be a job destroyer, not a job creator….This is the “race to the bottom,” a process that drives incomes ever lower. It is also straightforward supply-and-demand economics at work…This is the dehumanization of labor. No other major country treats its workers as commodities in this way, as raw materials or components that can be bargained to the lowest price. Racial progress, if not racial harmony, is real. The past three decades in particular have seen once-closed doors open for the vast majority of blacks. Anyone who can recall the legal segregation of the immediate postwar years must marvel at the changes. But economic problems threaten much of this progress. The retrogression of the racial fabric that we’ve seen is part of that social unraveling that he saw unfettered globalization imposing on America. One of the major themes woven throughout the book is the moral bankruptcy of America’s elite and more broadly those who, like me at that time, were living large and loving life thanks to this new economy. The upper 20% retreats to its gated communities in the suburbs, withdrawing not only physically but psychologically and socially from the country around it. They are not only the wealthy, the executives and traders, but also the economists, journalists, and others who tout the global economy largely because they are best equipped to cope with it and most insulated from its effects. These fortunate few go by different names. Rohatyn calls them the “technological aristocracy.” Robert Reich, the former secretary of labor, calls them “symbolic analysts”….I prefer to think of them as global citizens, having more in common with the elites of Tokyo and Frankfurt than with the other Americans who live beyond the gates, in the shantytowns on the outskirts of the global village. Any country needs its elites. It needs their money, and more important, it needs their leadership. Now the United States is losing its elites. American traders usually have more formal schooling than their British counterparts, but they have no less ambition and no more real knowledge of the world. Most know the difference between normal risk and betting the bank. But some don’t. Most are honest. But some aren’t. Barely prepared and innocent of ethics, these traders are pitched into stupendous sums of money. Once the social contract expressed a deal between the wealthy and the poor, between businesses and their employees. Economic change has always brought both gain and pain. But in the short run, the wealthy were more likely to get the gain, and the poor more likely to feel the pain. The great stabilizer of postwar industrial society was the recognition by government and business that, if change creates both winners and losers, then the winners have an obligation to help and compensate the losers. This was more than simple fairness. It was good politics. It was the price that the winners paid to pacify the losers, who had the vote. If the pain became too great, the losers would stop supporting the system that caused the pain. So the Western nations created the safety net, a social balm that soothed the pain and kept the losers non-mutinous. This social contract has been broken. Footloose global corporations have stopped paying the taxes that financed it. The slack has been taken up, at least partly, by higher taxes on workers. In other words, workers are financing their own social contract. It’s robbing Peter to pay Peter. The losers are comforting the losers, while the winners pay minimal taxes in Indonesia or buy bonds in cyberspace. Or set up shell companies in Ireland or Luxembourg. The merits of corporate taxation are debatable. But we’ve all read the stories of how these Silicon Valley firms have racked up gigantic profits while using complex strategies to pay little if any tax. It’s indisputable these companies have little concept of the social contract as previous generations understood it. These global companies have even seceded from national legal systems in favor of private justice. Even the functions that the governments used to do are being taken over by the global market. With no global laws or regulations to discipline these global markets, a sort of privatized form of justice has arisen. Around the globe, private arbitrators and arbitration centers are producing a “transnational legal profession and indeed a transnational private judiciary. These arbitrators, being private, compete for business and so depend on the goodwill of the corporations they judge. These corporations, in turn, use this private judicial system largely to escape the jurisdiction of national courts. These private courts can even force nominally sovereign nations to submit to them. That’s because these trade treaties set up international arbitration courts that empower businesses to sue countries outside of those countries’ home court systems. This is nothing less than a destruction of sovereignty, and one of the biggest complaints critics have about these “trade” treaties. There’s a reason it takes 5500 pages to print a so-called “free trade pact” – and it’s not free trade. As you can see, there’s a ton that Longworth got right 20 years ago – and he put his finger on issues that are if anything more relevant to public debates now than they were then. 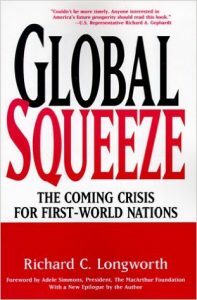 In fact, a few anachronisms aside, Global Squeeze holds up very well and is still eminently worth reading today. If nothing else, doing so will make clear that anyone who claims “we didn’t see it coming” isn’t telling the truth. Some people did see it coming. But they were ignored. That’s not to say Longworth predicted or got everything right. In the second part of this series I’ll highlight the areas he missed, and also how cognitive dissonance on his part and that of others like him who were sharply critical of globalization back then fatally undermined their efforts at reform and led them to ultimately be perceived as champions of globalization. excellent summary Aaron. Heck, even the radicals over at Naked Capitalism might enjoy this book review-you might submit it to the blog for publication? What basenjibrian said… very timely and well written. >I was aware that manufacturing was in structural decline, but my assumption was that this was >transitional and generational. Future generations would enter the exploding white collar workforce as I >had and industrial displacement would be as forgotten as agricultural displacement had been. Aaron, this foolishly optimistic idea was a late 90s article of pure faith! (I shared it, unfortunately). If anyone had suggested anything other than a smooth and upward path for all those displaced workers, they would have been regarded as prospects for a tinfoil hat. Everyone “knew” that technology and progress would make it all work out happily–somehow. How times change! Thanks for letting us know about this book. I loved “Caught in the MIddle,” too, and am glad to know about this one. I remember thinking that valuing craft/labor is an essential feature of the commonwealth, and when educated people stop respecting its value, importance, and meaning, we’re in trouble. Melman saw it much earlier. Before China there was Europe and Japan. US not only funded rivals;but also provided tech transfer. “We have trained a large part of our workforce —more than three million in military industry — to work under a regime where escalating cost isacceptable because there will always be a subsidy to offset the cost increase. The damage took effect by mid 1960s;and first deficit was in 1970s. Check out pivotal decade by Judith Stein. As Judith Stein observes in Pivotal Decade, the 1970s was the only decade except for the 1930s during which Americans grew poorer. By the late 1960s, around a quarter of all new investment by US companies in electrical and non-electrical machinery, transportation equipment, rubber and chemical manufacturing was being made abroad. As the new decade began the US suffered its first trade deficit since 1893. By its end productivity had slowed and turned negative; the US share of the world market for manufactured goods shrank by 23 per cent. America’s share of world steel production shrank from 50 to 20 per cent. Only the UK had a lower rate of gross capital formation as a percentage of GDP. Stein argues that this was a fundamental structural crisis, not merely a low point in the economic cycle. Core sectors of American industrial capitalism could no longer compete: plant and equipment were increasingly antiquated; productivity was declining compared to European and Japanese producers, whose revival had been made possible by Cold War imperatives. Trade, currency and other measures favoured Western Europe and Japan even when that meant loading American industry with burdens it couldn’t bear: this was the price of empire. At the beginning of the decade members of a still powerful labour movement, deploying the leverage it enjoyed thanks to Vietnam War-generated full employment, went on strike in numbers not seen since the wave of strikes that followed World War Two. But the administrations of Nixon, Ford and Carter weren’t particularly moved by the industrialists’ troubles. Later, the double-dip oil shocks that followed the Opec embargo of 1973 and then the Iranian Revolution of 1979 served to ratchet up the costs of production in an increasingly oil-dependent economy. Profit rates shrank as the nominal value of US industry’s assets greatly exceeded their real worth in the international marketplace. Capital began flowing elsewhere, not just into Europe but also into select parts of the Third World, and into non-industrial sectors – finance especially but also real estate, retail and service businesses – and into an increasing array of leveraged speculations in corporate and government securities. So began the deindustrialisation of America, the shutting down of what had for a century been the engine house of the economy. A whole way of life was headed for extinction. US also could not develop white collar rise because of suburbanization and weakness of transportation networks. “commuting problems highlight a central theme for many low-income people trying to build a better life: A lack of reliable and efficient transportation is often a huge barrier. There was a compounding of flawed policies. Hey there is a reason why even Pakistan has more upward mobility than US! Oh and more to come. Even Hawking sees it and Musk says he sees necessity for universal basic income. “I polled dozens of start-up founders and conducted interviews with a handful of notable billionaires and household names. I asked how they thought the future of innovation would affect ordinary people. The answers I received made clear that Silicon Valley’s elites envision a world in which an increasingly greater share of economic wealth will be generated by a smaller slice of very talented or original people. Everyone else will increasingly subsist on some combination of part-time entrepreneurial “gig work” and government aid. The way the Valley elite see it, everyone can try to be an entrepreneur; some small percentage will achieve wild success and create enough wealth so that others can live comfortably. Many tech leaders appear optimistic that this type of economy will provide the vast majority of people with unprecedented prosperity and leisure, though no one quite knows when. Inequality is something of a taboo subject in the Valley. Rarely do technologists talk about how they feel about the subject in public. Many take a pessimistic view of most of the workforce. And they fear what will happen when they build robots that can perform most jobs much better than the average human. All respondents said that a meritocracy inherently leads to an unequal world. Please also note the lousy quality of education in K-12 schools which provide low income Americans is another huge problem, ESPECIALLY now as majority of poor children in schools are POOR! “Education is deeply unequal in the United States, with students in poor districts performing at levels several grades below those of children in richer areas. Yet the problem is actually much worse than these statistics show, because schools, districts and even the federal government have been using a crude yardstick for economic hardship. Do visit Eric Hanuseck on the importance of education. He is an ed specialist at Stanford at Hoover. Are you aware of excessive reliance by US on foreigners for innovations? And why is that? because of lack of rigor in its K-12 system. I found how bad it was when someone I know had trouble in math and science classes at MIT despite being an Honior Student in goodg school system in one of the better states as ed concerned (NJ). “About 76% of the patents at the top 10 patent-producing U.S. universities in 2011 had at least one foreign-born inventor, according to a new study by The Partnership for a New American Economy. The most serious problem is in the area of STEM (Science, Technology, Engineering, and Math), where there are almost 3 million unfilled jobs, but only about 300,000 graduates annually. This shortage of US-born STEM workers gives companies two choices: import costly foreign labor, or move operations abroad. In fact, according to the OECD the US has less PhD STEM graduates (per million population) than many other developed countries. The picture is even bleaker when one considers that many of those advanced degrees are awarded to foreigners. For example, about half of all engineering doctoral degrees are awarded to non-US nationals. The implications of this shortfall are not only economic, but also a national security concern as it will become increasingly difficult to fill sensitive security-related jobs. BY Miha Vindis, LBJ School Ph.D. student. Aaron, you attracting some very interesting observations in your comments to your. I look forward to your next installment on Longworth. Winston, you are on fire.